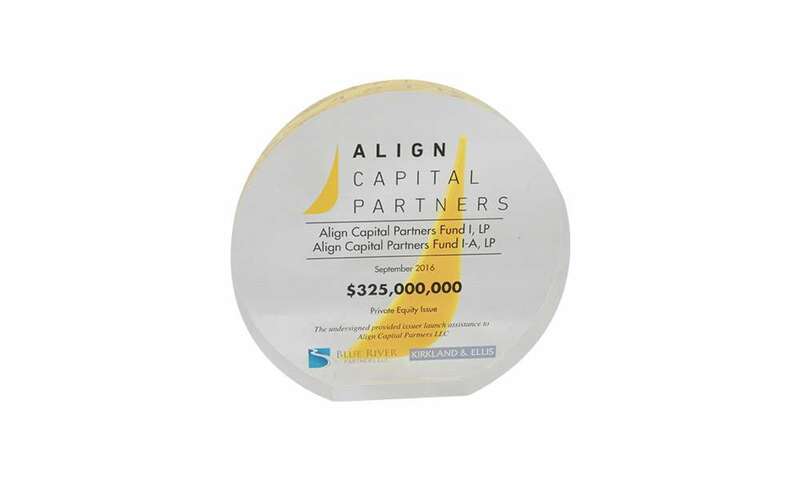 Custom Lucite marking the closing by Align Capital Partners of its first private equity fund. The firm is co-headquartered in Cleveland and Dallas. (7AKL072). 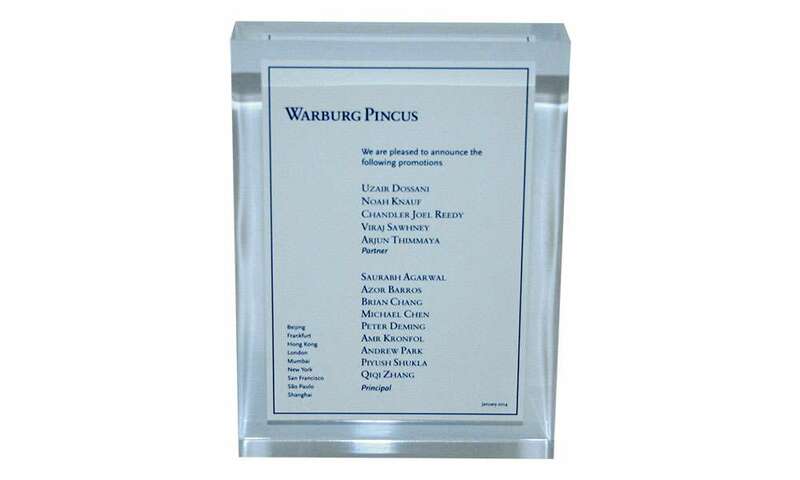 (Follow this link to see other fund closing tombstones). 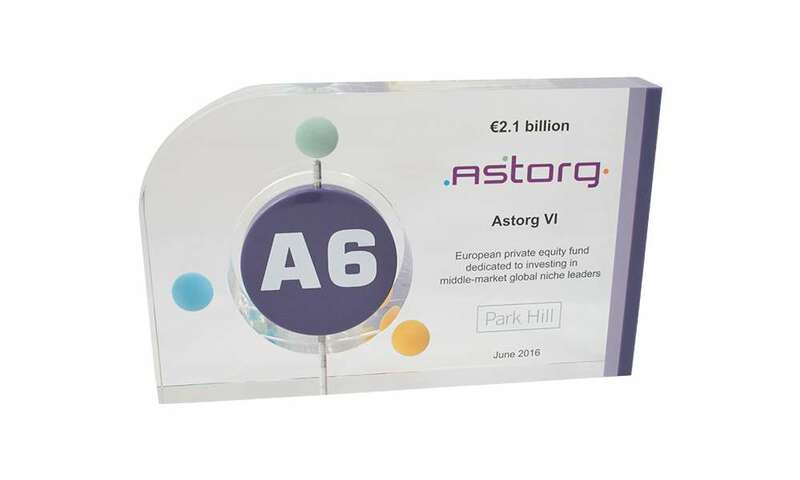 Lucite tombstone marking the closing of Astorg VI, a fund raised by Paris-based private equity group Astorg Partners. 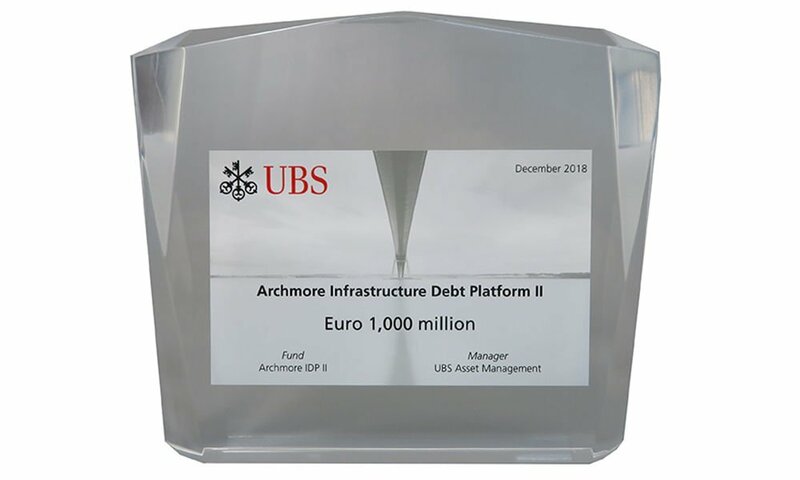 The fund will focus primarily on European middle-market opportunities. (R0JWD71). 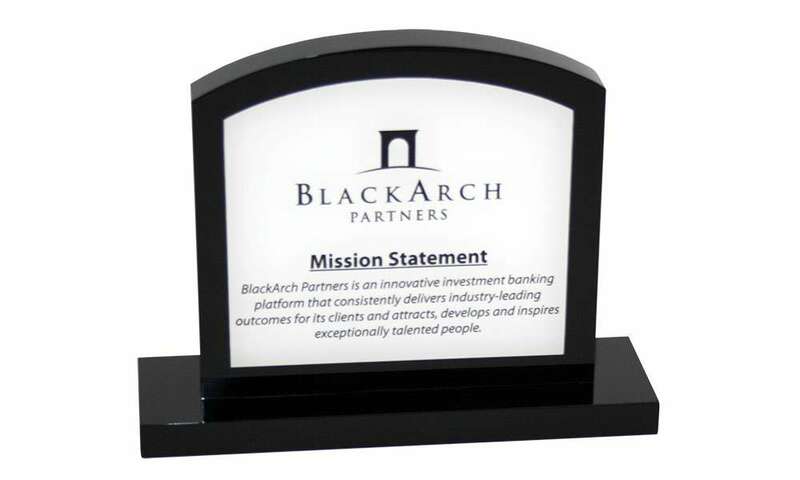 (Click here for other fund closing tombstones). 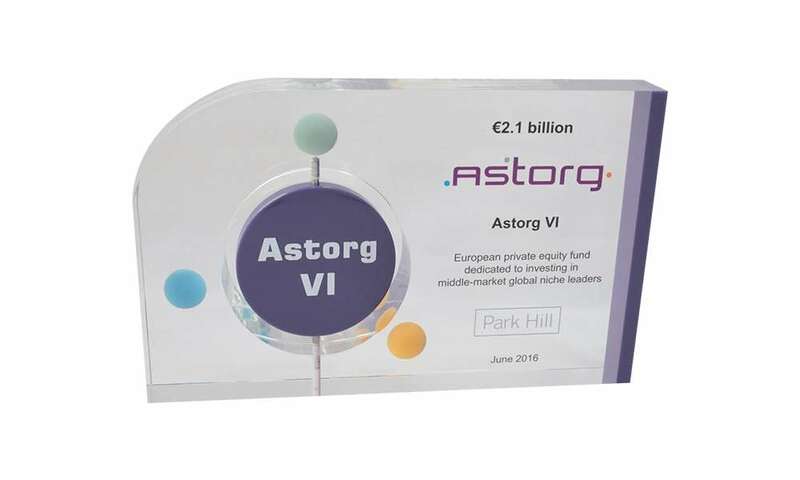 Custom tombstone commemorating the closing by Astorg Partners of its Astorg VI fund. 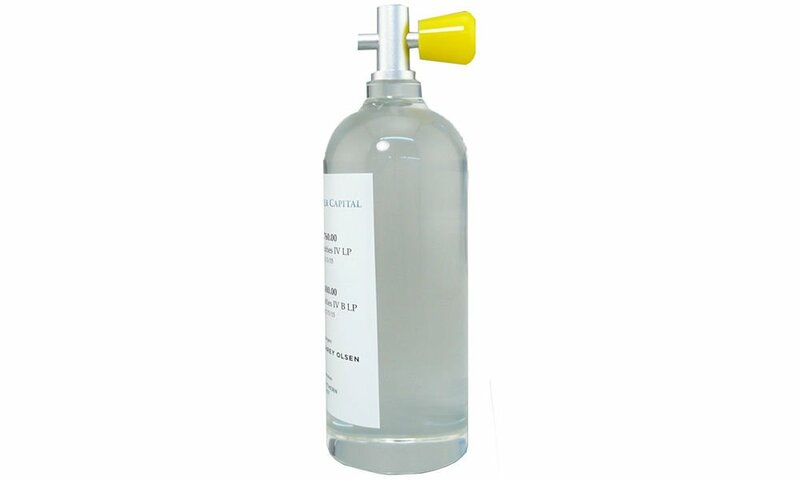 (R0JWD71). 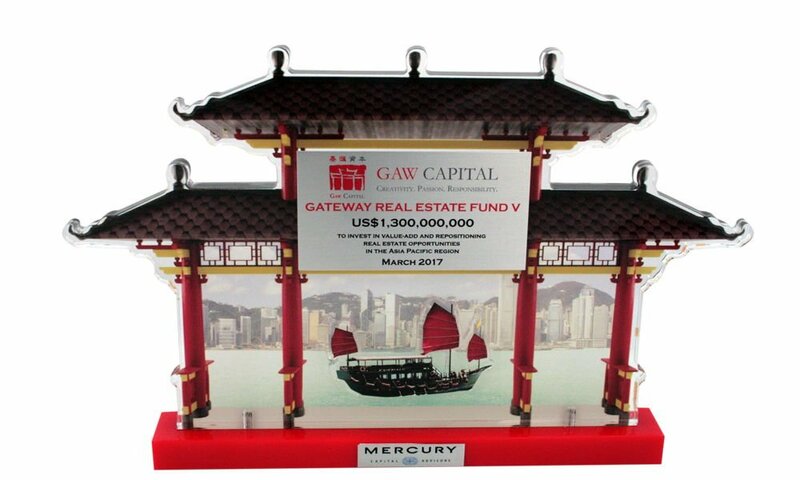 (Follow this link for other fund closing commemoratives). 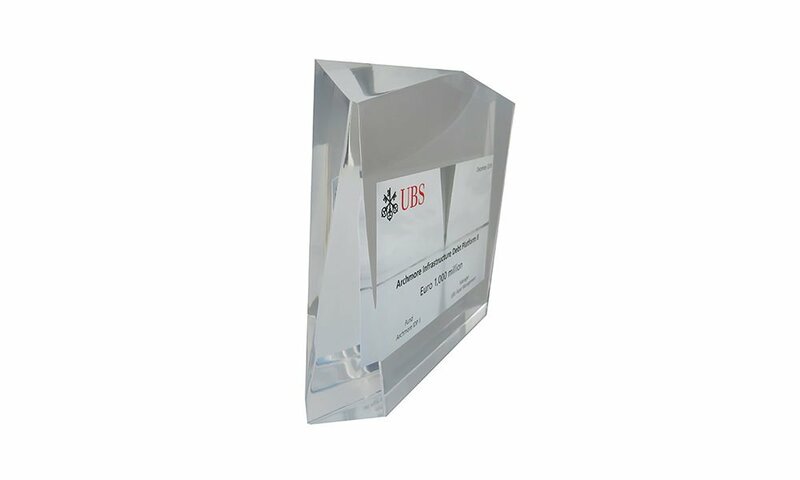 Lucite award recognizing an employee contribution to the company’s compliance efforts. 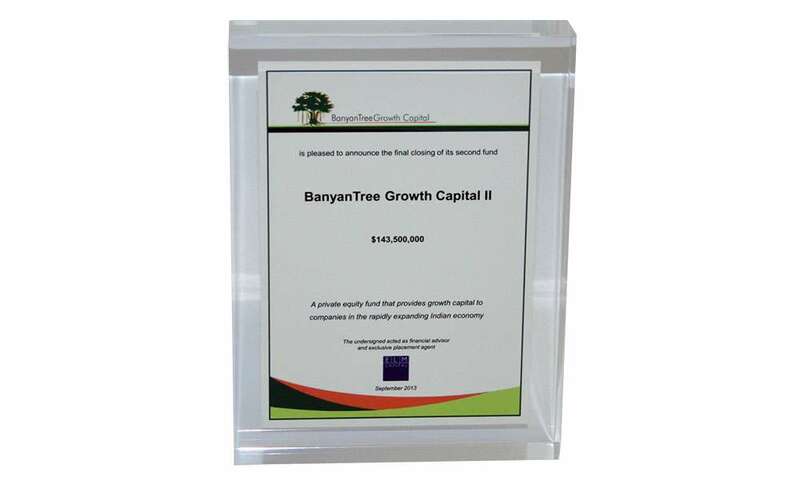 Lucite tombstone recognizing the launch of a fund sponsored by BanyanTree Capital Advisors. The fund focuses on small and mid-market Indian companies. 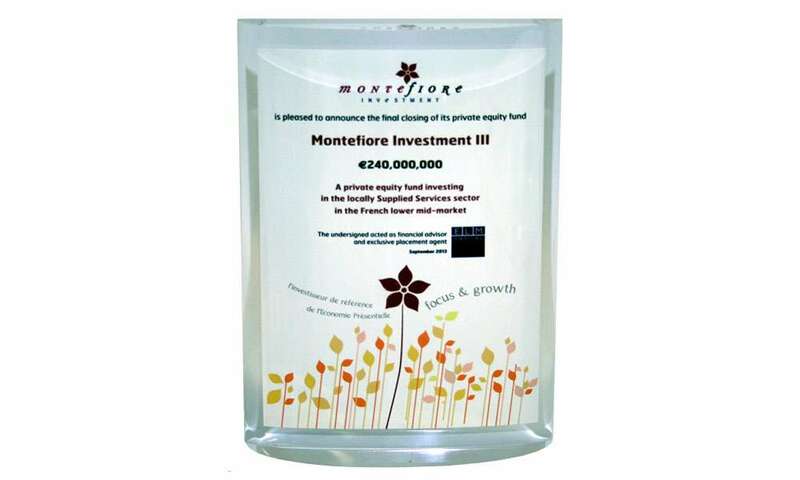 Lucite commemorating the launch of fund by Paris-based Montefiore. Montefiore focuses on investments in locally supplied services in France. 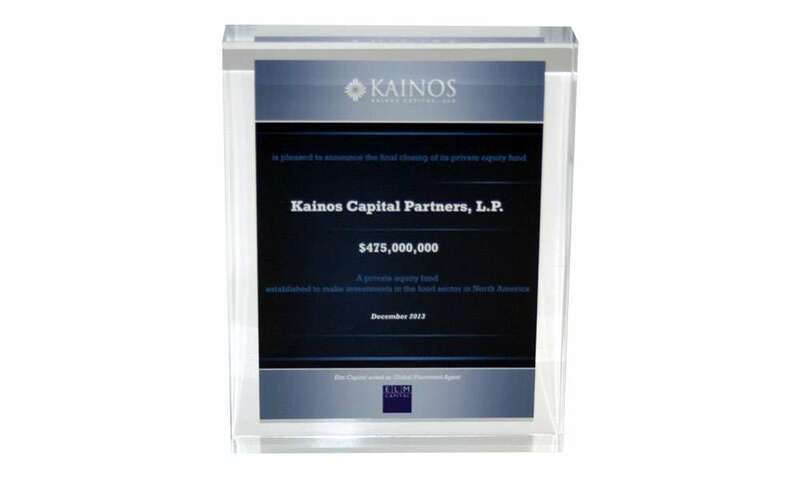 Lucite deal toy recognizing fund launch by Kainos Capital. Dallas-based Kainos concentrates on the food and consumer sector. 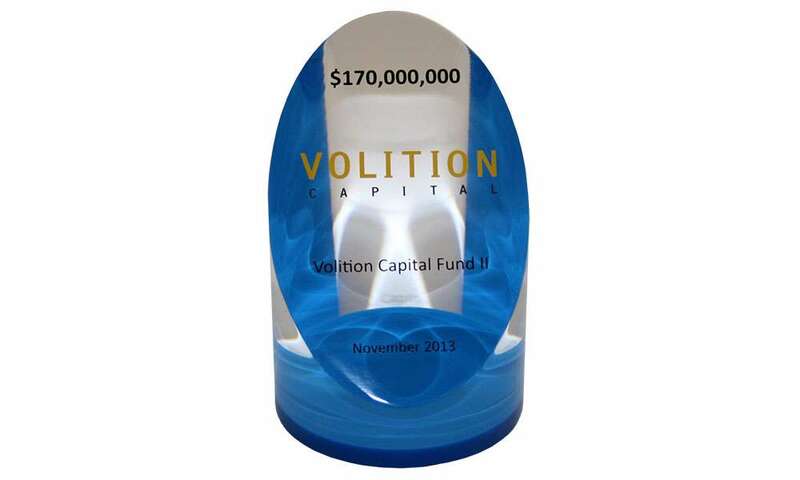 Custom deal toy marking the launch of a fund by Volition Capital. 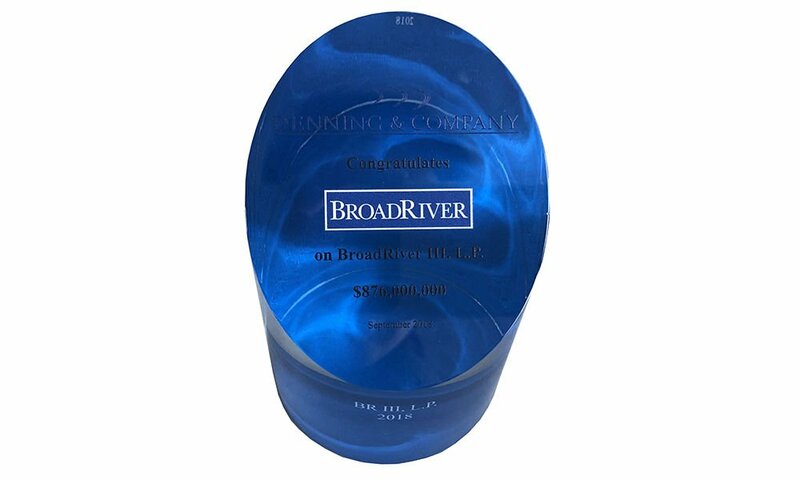 Custom Lucite marking closing of a global emerging markets fund. 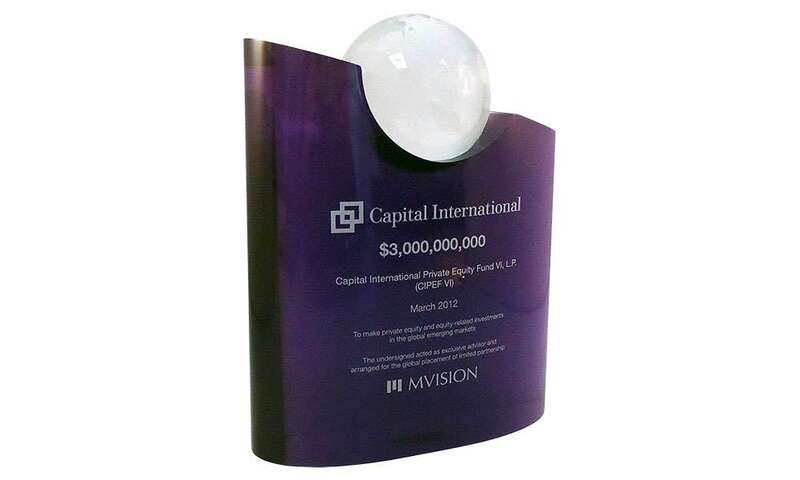 The fund is managed by Capital International. 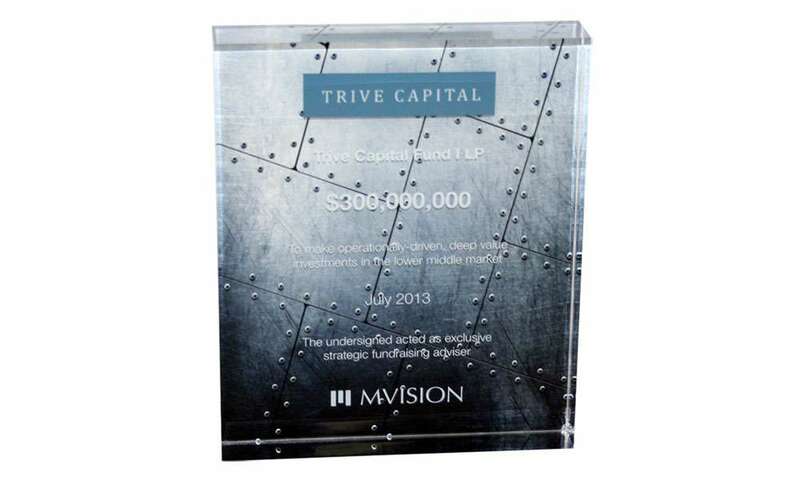 Lucite commemorating fund launch by Dallas-based private equity firm Trive Capital. 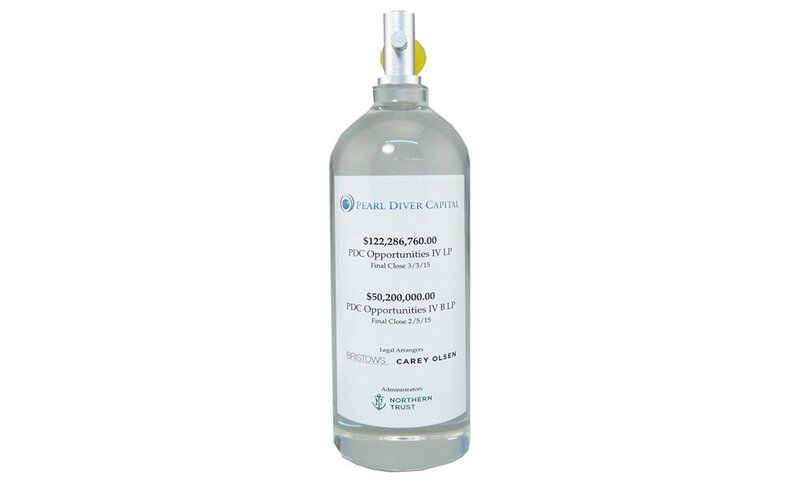 The fund concentrates on lower middle-market companies based in North America. 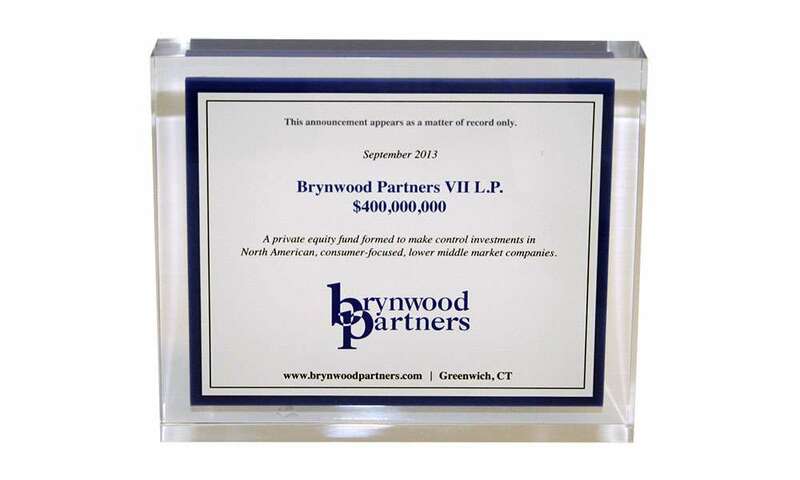 Lucite tombstone marking the closing of a private equity fund launched by Brynwood Partners. Brynwood is located in Greenwich, Connecticut. 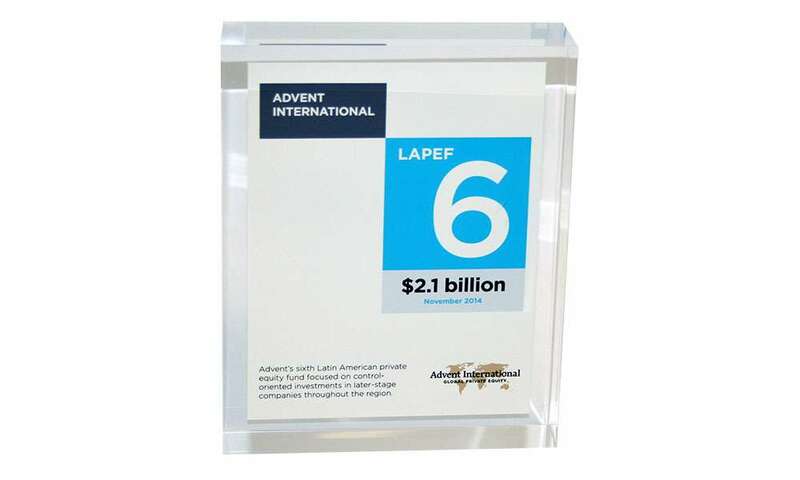 Lucite deal toy commemorating a fund launch by Boston-based Advent International. The fund is the largest private equity fund focusing on Latin America. 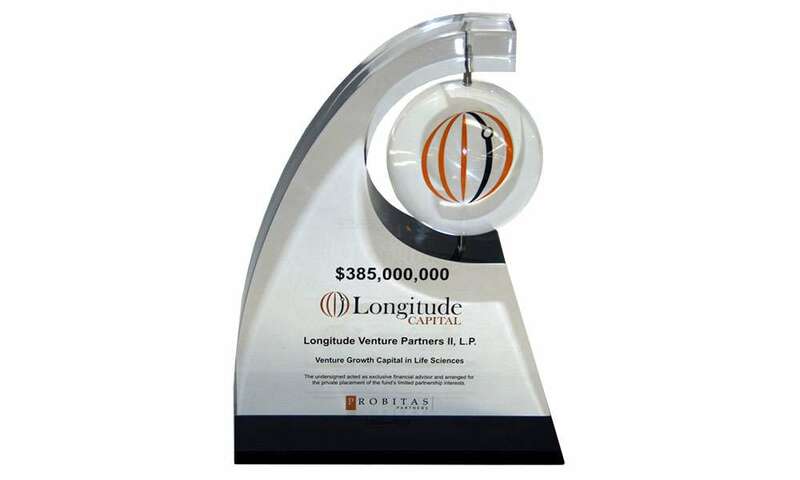 Lucite recognizing the closing of a fund specializing in mezzanine financing. 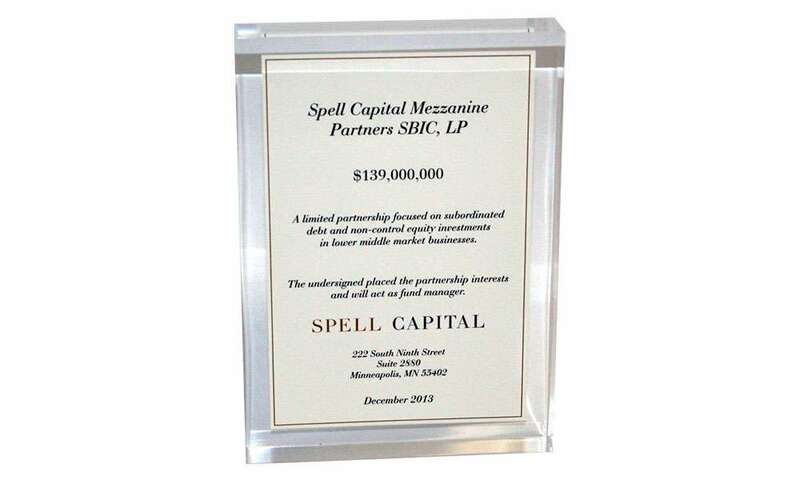 The fund is managed by Minneapolis-based Spell Capital. 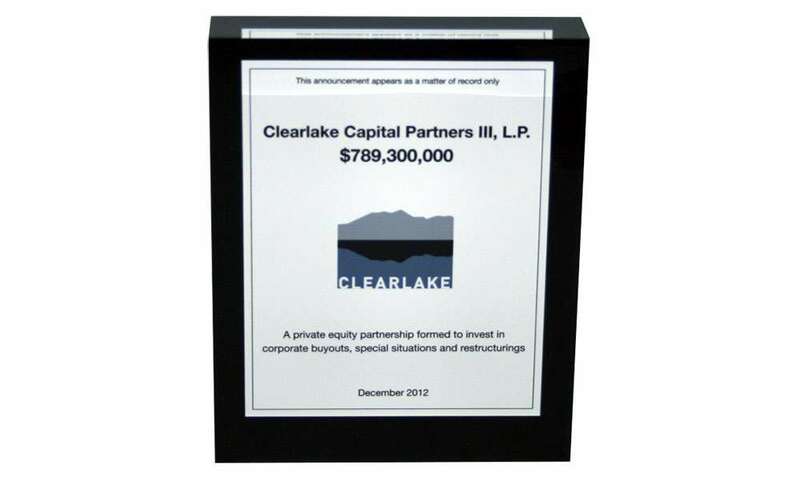 Lucite deal toy commemorating the closing by Clearlake Capital Group. Clearlake is located in Santa Monica, California. 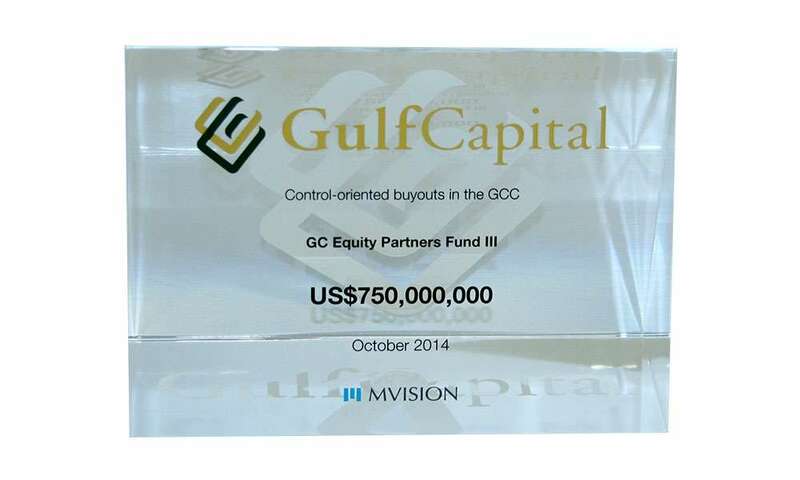 Custom Lucite marking the closing of buy-out fund launched by Gulf Capital. 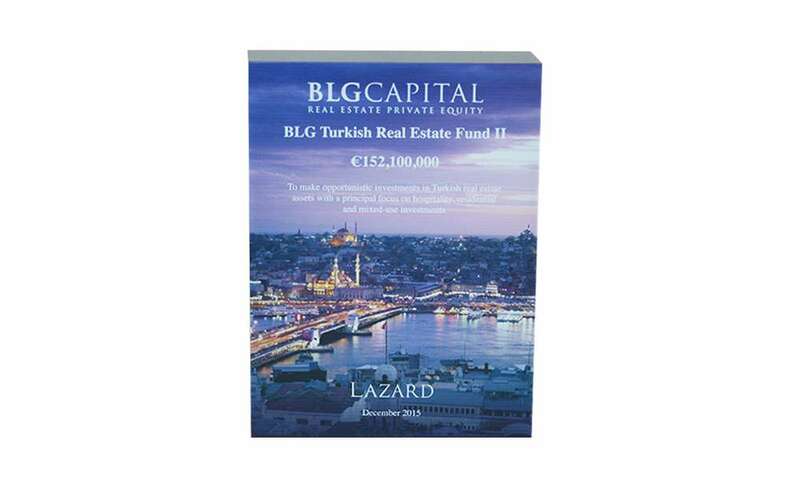 The buy-out fund will concentrate on opportunities in the Middle East. 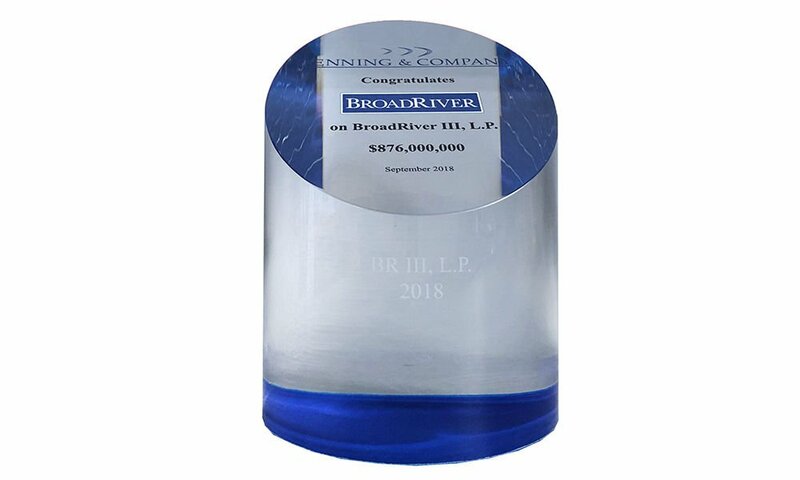 Custom Lucite commemorating the closing of a fund focused on middle-market companies. 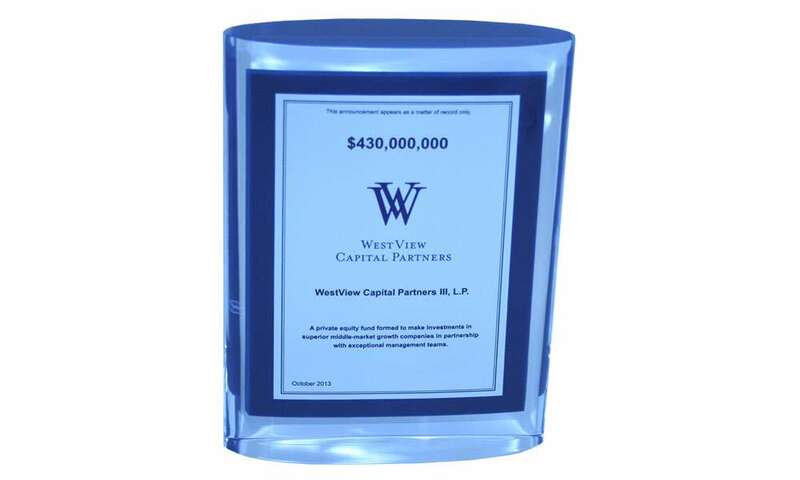 WestView Capital Partners is based in Boston. 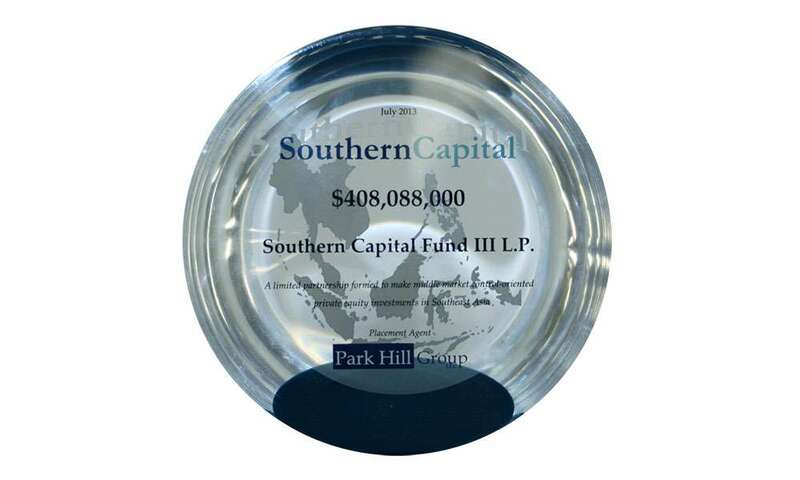 Custom Lucite recognizing the closing of the Southern Capital Fund. The fund is concentrated on middle market investments in Southeast Asia. 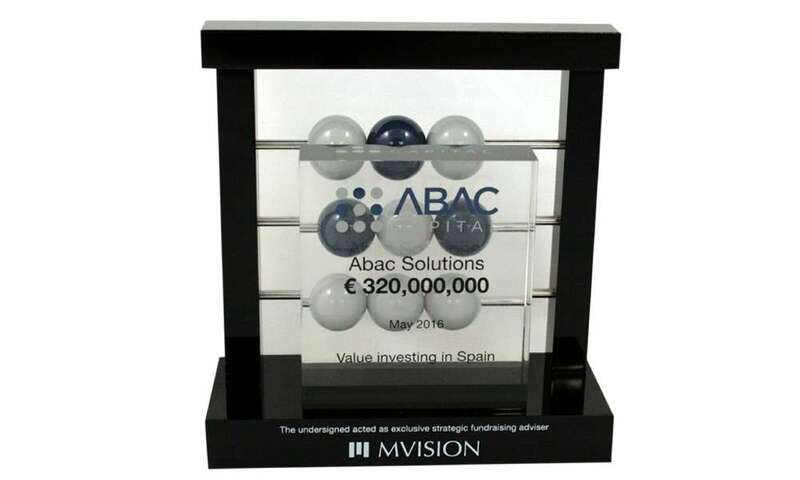 Custom tombstone marking the closing of a fund focusing on growth in the life sciences sector. 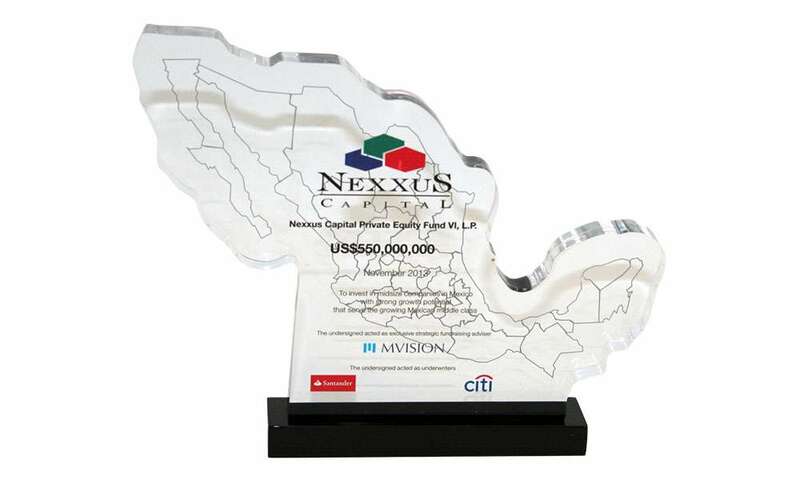 Custom Lucite commemorating the closing of the Nexxus VI fund. 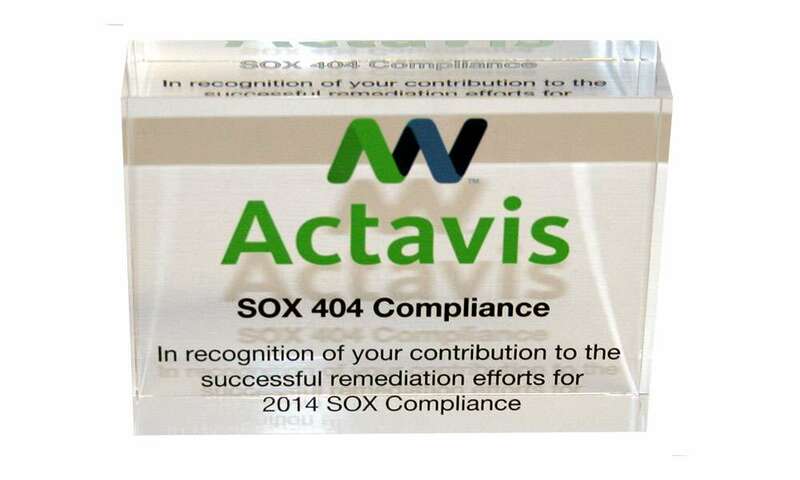 The fund is focused on investments in midsized Mexican companies.